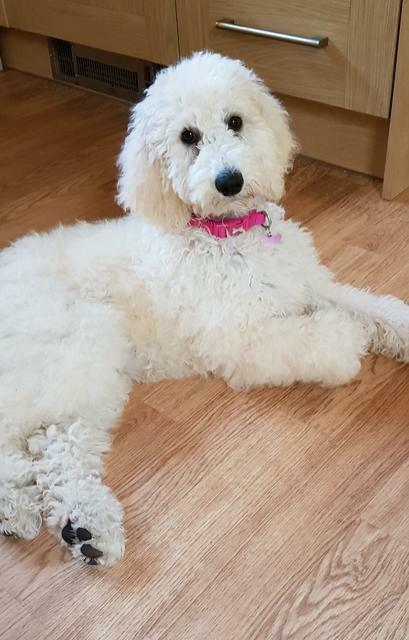 UK Labradoodle Association • View topic - Toilet training continues! Post subject: Toilet training continues! Hi. Luna is 16 weeks - been with us for 7 weeks. Although she has never messed in the house, she continues to wee sometimes. We can have a couple of good days and then a day with 2-3 accidents. This morning when it was raining heavily (first time she has seen rain) she went out did a poo and came in and weed on the carpet. We have been very consistent and she is dry all night and she is extremely quick on other training having learned all the basics within days and is the star of the training class. However the wee problem persists. She is absolutely adorable now having got over the mouthing stage - still quite hyper at night but definitely more biddable. We have had 5 Golden Retrievers previously who were very easy to housetrain. I wonder if it would be an idea to have all the carpets cleaned to remove lingering scent? We do use a Pets at Home biological cleaner for accidents but I wondered if anyone had any thoughts? Post subject: Re: Toilet training continues! Both my dogs weren’t actually properly dry til about 5 momnths. Then I didn’t realise they were. I think it’s when I stopped being worried about it that it happened I’m not sure having the carpets cleaned is a good idea because it will be a change but I’m no expert on this as yiu can see. Bbjust perhaps go back to basics. Take her out regularly, praise her excitedly when she goes, I say good weewee. I’m not sure if she has a command word but now if I call my 6 year old down at night I call Lulu, wee wee. (The dog that is) she comes down and performs. My younger dog just follows her. Ha ha - they do have funny ways don't they! Luna will only poo in undergrowth and where she can't be seen. Funnily since the weather changed and doors have been closed she has been better.....here's hoping! I cant believe how fast her fur grows - she was groomed 2 weeks ago and already needs a face trim! Her coat goes VERY curly in the rain - almost ringlets, very pretty but high maintenance! How often does Dude need trimming? Dude goes to the groomer every 8 weeks, but I trim him( with scissors)frequently during that time. He has tight poodly curls and I keep it short so I don't havve to brush him daily! Lazy eh?! He keeps very still and I'm thinking I might invest in clippers and do it myself. Is Luna 1st gen? These doodles vary so much don't they?! Dude has a woolly poodle coat- parents both doodles.